Developed by Professor Golan Yona and his colleagues at Cornell University, the Biozon database aids in the analysis of biological entities. The "database relies on an extensive database schema that integrates information at the macro-molecular level as well as at the cellular level, from a variety of resources to create a unified biological knowledge resource with emphasis on protein and DNA characterization and classification." Biozon builds on data from a number of preexisting databases including PDB, BIND, KEGG, and SwissProt. 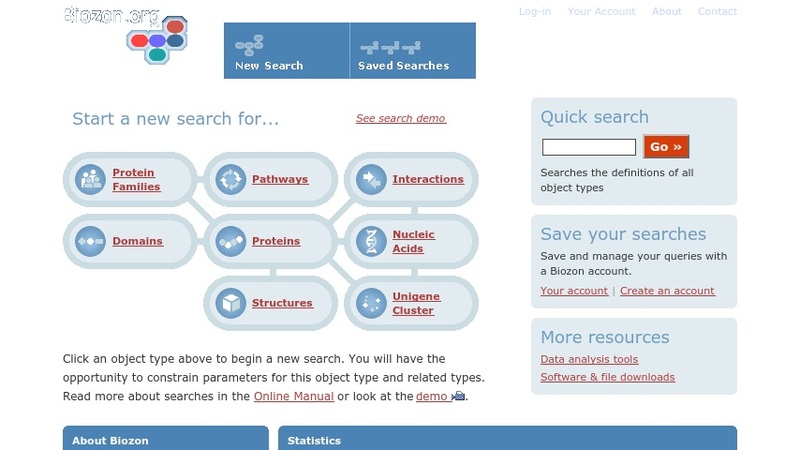 New searches can be conducted for the following object types: Protein Families, Nucleic Acids, Gene Expression, Structures, Proteins, and more. Biozon offers file and software downloads, as well as an opportunity to save queries with a personal account.